Blasting a rock in space. Pew pew. You may have thought, “Hey, if we’re threatened by an incoming asteroid, we should just nuke it!” You’re not alone: a team of Russian scientists are working on a plot to do so, by detonating miniature asteroids in a lab. In fact, several groups of researchers are now toying with the idea of asteroid nuking for the sake of planetary defense. The Russian team has even calculated about how much firepower they’d need to perform such a feat. That’s three megatons to blow up an asteroid twice the size of a football field, or a bomb 200 times more powerful than the bomb dropped on Hiroshima. This paper should be taken with a grain of salt, of course. The researchers from the Moscow Institute of Physics and Technology, Russian Federal Nuclear Center and ROSATOM didn’t nuke a real 200-meter asteroid in a zero gravity environment. 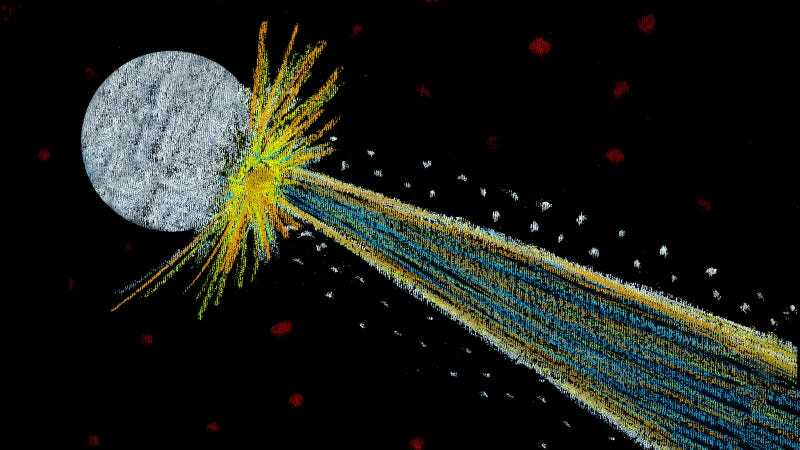 Instead, they used a laser pulse to zap a four-millimeter asteroid model, based on the composition of meteorite fragments. That laser pulse was certainly high energy for its size, 200 joules (the energy required to slide a two-ish pound box 600 feet on a frictionless surface). But that’s no nuke. A very silly image that came with this press release. The Russians aren’t the only ones considering nuking asteroids. Universe Today reports that NASA is working on a project called HAMMER, or Hyper-velocity Asteroid Mitigation Mission for Emergency Response. As writer Evan Gough notes, it’s just an idea. An idea to nuke asteroids. These ideas aren’t totally out there, though. NASA does track most of the so-called “potentially hazardous” near-Earth objects, none of which are actually hazardous today. Given a 100-year warning, there are a lot of simple things you can do to slightly perturb an asteroid’s orbit to prevent it from hitting us. 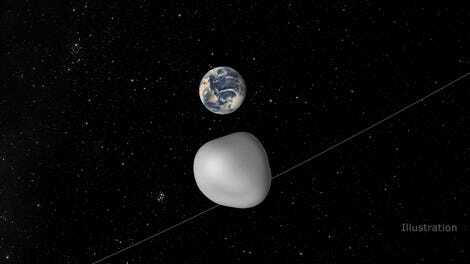 But as we’ve noted in the past, NASA does not track all of the nearby asteroids smaller than 140 meters in diameter. A 140-meter untracked meteorite showing up out of nowhere would spell bad news. Even a 20-meter object, the size of the Chelyabinsk meteorite, hitting an urban area could cause catastrophe. Still, there’s way more work to be done. Asteroids can vary wildly in their composition. Some are large chunks of rock, while other are “rubble piles” loosely held together by a tiny gravitational force, according to the European Space Agency. 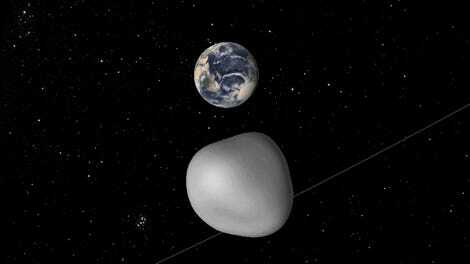 The researchers plan to further study the effect of their lasers on other model asteroids. So, don’t go asking for space nuke poliferation just yet. Or at least, don’t go basing your judgment simply on what happens to pebbles in a lab.